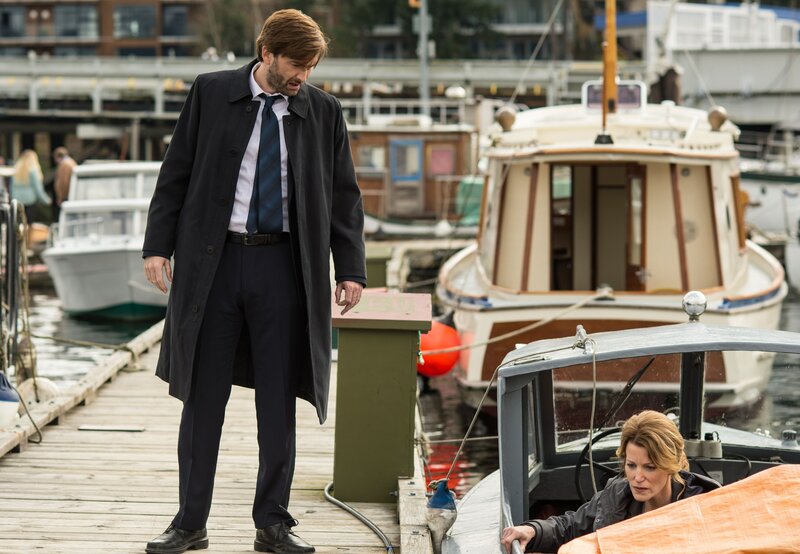 In case you forgot that “Gracepoint” is supposed to be creepy, this week’s episode opened with Mark walking past the police tape into Danny’s room to find his dead son crying in the closet. As Mark comforts Danny, we quickly cut to Mark’s face lying in bed and assume this is all a dream. Viewers learned a lot from last week’s episode. This week, not so much. Some questions were answered, but more new questions arose. A lot went on in this week’s episode, but in my opinion much of it was of little importance. Renee annoyed townspeople. Susan was generally creepy. The Ghost Whisperer returned. Paul comforted Beth. Etc. It turns out our Ghost Whisperer was right about the boat thing. While standing on the edge of Harvey Ridge, Carver wonders why the killer would move Danny’s body to a different part of the beach instead of just throwing it over the cliff right here. He realizes that if the killer used a boat to transport Danny’s body, he/she would have left no tracks behind, and the water would have washed all evidence away. Mark is brought in for questioning because he couldn’t definitively say where he was the night Danny died, but not before he texts Vince asking him to cover for him. Mark tells Miller and Carver that he was with Vince that night, and that the days were starting to blur together. Vince confirms Mark’s lie, saying that the two went to dinner and drank together that night before returning around 1 a.m. However, Vince’s mom blows their cover: It turns out Vince was at home with her the whole night, except for a run to the drug store. The police also ask if Mark has ever been to the hut on Harvey Ridge. Mark tells them he went there a few weeks ago to fix a burst pipe. But Susan Wright says a pipe has never burst in that hut, and that Mark never came to her for the keys like he said he did. Two strikes for Daddy-O. Then, Carver and Miller find blood in Mark’s boat, so things are really not looking good for him. Mark says the blood is in fact Danny’s, but claims Danny gashed his foot while he was fishing a few weeks ago with Mark and Chloe. Given his previous lies, Carver doesn’t buy it, and Mark is arrested for obstruction of justice in a murder investigation. Later, we see Chloe write a text to an unknown person telling him/her that he/she needs to tell the police if he/she knows where her dad was Thursday night. A few scenes later, Gemma comes into the police office and tells Carver and Miller that Mark was with her Thursday night. I’m not condoning adultery, but man was I happy about this. I WAS RIGHT, PEOPLE! MARK IS HAVING AN AFFAIR!!!!!!! SEE MY WEEK 1 PREDICTIONS!!! Anyway, after learning this, the detectives let Mark go home. But Carver isn’t sold that this was all a big misunderstanding. How old is the blood in the boat? And why are Mark’s fingerprints really in the Harvey Ridge hut? Even Ellie is suspicious. After Mark gets home, he and Beth are lying in bed when she asks if he is going to tell her where he really was the night Danny died. He says he will, but not now, so Beth comes right out and asks him if he killed Danny. Mark is horrified that she would even ask him that, so he leaves to take a walk, and goes to the inn to see Gemma. He says that their affair was a stupid mistake, and that Danny’s death is his punishment for his indiscretion, but he isn’t angry. Gemma kisses Mark goodbye just as Beth, who also decided to take a walk, is conveniently passing the inn. Carver meets with a doctor who he calls ‘the first friendly face I’ve seen in months.” The doctor says that Carver needs to change his lifestyle of else he’ll end up dead. “This is a bomb in your system,” the doctor says. I don’t know what “this” is, but working in such a high stress job is definitely aggravating it. Carver says he can’t stop working, not now, even though he hates the town and the people and the atmosphere. So why is he here? Penance, he says. Penance for Rosemont, which we still don’t know too much about. Renee approaches Carver in the street one night and says she is “haunted by what happened,” too. Renee reveals that she was “in that courtroom when it all fell apart,” and mentions that one of the girls who went missing, would have turned eight on Sunday. Towards the end of the episode, Carver asks Ellie to call Chloe and demand she tell them where she got that cocaine. Ellie says she won’t do it, because it’s late and Chloe might be sleeping, and the family has been through enough today. Carver is convinced Ellie’s involvement in the town is clouding her judgment in the case, and he is not happy that she defied his orders. Carver calls Chloe himself, and tells her she needs to tell them where she got the drugs in the morning. She has the night to think about it. As Carver is walking out of the station, a forensics worker approaches him with news: They found a shred of a crossword puzzle in the lining of Danny’s jacket. It must have fallen through a hole in his pocket, and a phone number is written on it. Carver is angry –Because he’s always angry, but also that it took so long for them to find this. Carver rushes back into his office and searches the phone number. As he is awaiting for the search results, of course, the episode ends. Prediction 1: The phone number is of the random backpacker that Jack Rinehold saw with Danny. Prediction 3: The Ghost Whisperer actually killed Danny, and that’s how he has all these “messages” from him. Not this “spirit guide” business he talks about. He knows that Danny was in a boat the night he died because he put him there. He tells Beth that Danny doesn’t want her to look for his killer because if it is someone he knew well, it will upset her. But really, it was him, and he wants to throw the police off his tracks.